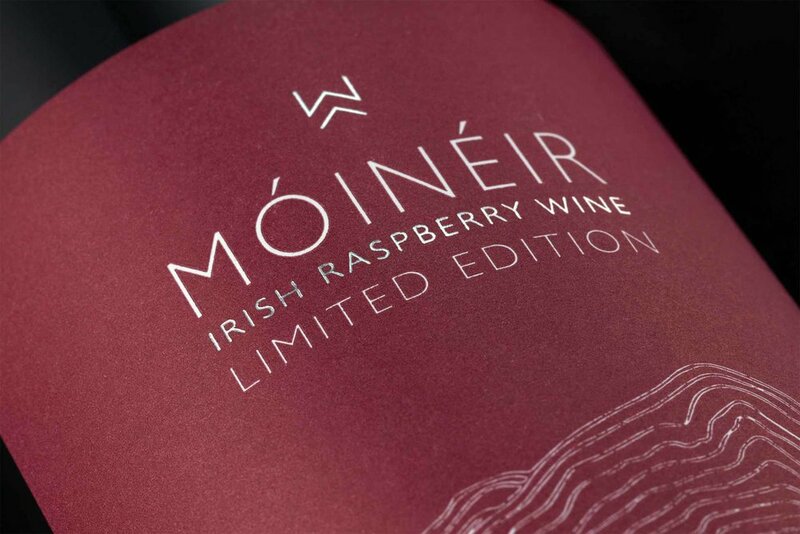 Inspired by the fertile countryside of Ireland, Móinéir is the Irish word for ‘meadows’, where we picked the berries for our first wines. Made in small batches at our County Wicklow winery, entirely from local Irish berries, our wines offer tantalising aromas, flavours and colours, and are a unique way to savour a little of Ireland’s rich bounty. Launched at Bloom in the Phoenix Park in June 2018 our Raspberry Wine, handmade in the lush, green countryside of County Wicklow, was created from raspberries grown in Ireland's fertile meadows. The purity and intensity of the flavours and aromas of the berries are reflected in the light-bodied, fine, off-dry style of the wine, capturing a rare taste of the fleeting Irish summer. Perfect as a gift or as a wine for special occasions, it pairs beautifully with a range of dishes. Buy from selected stockists in Ireland or from our online store. Our flagship Strawberry Wine is created from hand-picked Irish strawberries, with around one hundred and fifty small strawberries in each bottle, gently pressed to yield their juices, then carefully fermented over a number of weeks, and aged to a golden-red hue. This artisan wine is handcrafted in small batches in the Garden of Ireland. Dancing with the aromas of summer, the taste is complex and alluring on the palate, while a hint of sweetness gives way to full-bodied flavour, which tapers to a crisp finish. Pairing well with the light, fresh meals of summer, it is also delicious as an aperitif. Released in October 2016 our blackberry wine with wild elderberries deliciously captures the flavours of late summer and autumn. Elderberries are a native Irish plant, growing happily in meadows and hedgerows and often inhabiting areas that are quite inaccessible. The wild elderberries in this wine were painstakingly foraged around the Wicklow Mountains during autumn 2015, then blended with luscious Irish blackberries to create this delicious wine. With real depth of fruit flavour we have captured the moment when the Irish summer turns to autumn. Perfect as a gift or as a wine for special occasions, it pairs beautifully with red meats and cheeses. 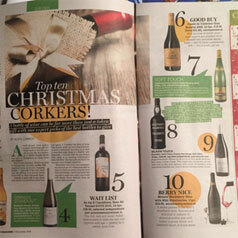 We'll send you occasional news and updates about what's happening with our Móinéir Irish Wines. You can unsubscribe anytime. We respect your privacy, so we'll never share your details. For those interested in the art of winemaking, the beautiful environment that grows our food, meeting their artisan producers, and even music - this is the place for you. 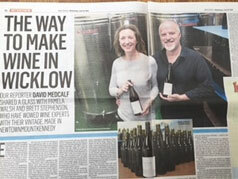 Set on the outskirts of Newtownmountkennedy, in the beautiful Wicklow hills, just 15 minutes from South Dublin, you’ll find our small winery among other artisan businesses. 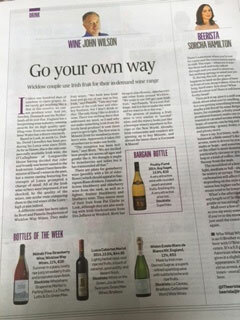 Our wines have been described by wine critics, top sommeliers, and Michelin star chefs as ‘stunning’, ‘beautifully crafted’, ‘pleasantly complex’ and ‘surprising and sophisticated’, and appear on the menus of some of Ireland’s Michelin star restaurants and luxury destinations. 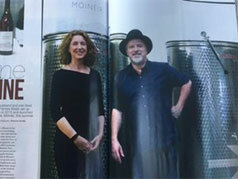 When you visit you’ll be welcomed by either Brett or Pamela, the founders and winemakers at Wicklow Way Wines, and we’ll guide you on your personalised tour around the winery. (Please note you’ll be visiting a working winery where the wine is made, rather than a vineyard or farm). As shown on Neven’s Irish Food Trails you’ll see where the wines are made, learn a little about how they’re made, and understand the care that goes into making small batches of these rare and unique wines, hand crafted from locally grown strawberries, blackberries and raspberries. Depending on the time of year you may see a fermentation underway, and experience the fabulous colours, amazing aromas and surprising sounds of the fermenting berry juices. You’ll learn what happens in the year between the initial fermentation of the juices and the bottling of the finished wines. We’ll show you how each bottle of wine is handmade and then individually hand bottled, corked and labelled. And then finally each individual bottle receives its own unique, hand written number, reflecting the small batch from which it came. After the tour we’ll bring you to the tasting room, overlooking the vats where you’ll taste our award wining wines, which are Móinéir Irish Strawberry, Blackberry and Raspberry Wine. As an extra treat the tasting will include a pairing with two Irish cheeses and chocolate (vegan options available on request), chosen for their high quality, wonderful flavours, and because they pair so well with our wines. We also have a small shop and if you like what we do we’d love you to pick up a gift for yourself or your family and help us spread the word! Book Here: So, if you’re ready to book please click here and you’ll be brought to our ticket purchasing page where you can purchase your ticket and book your tour to secure your place. If you received a ticket as a gift, or previously purchased it on our website or at a market, please contact us at [email protected] to arrange your tour. Here are a few of the things said about our wines - thanks to everyone for the kind remarks. 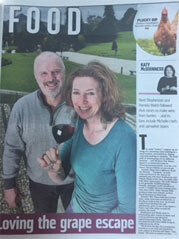 Below you’ll find comments from Michelin star chefs, wine critics, sommeliers, bloggers and even a prince! 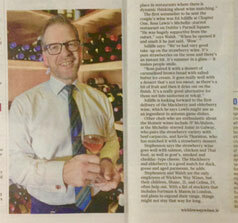 JP has been serving our blackberry wine on his tasting menus since around the time it launched, and has this to say…. Prince Charles and Camilla visited Ireland in June 2018 and took a walk around the English Market in Cork, chatting and tasting a selection of the artisan products available in the market. Stopping by wine merchant Billy Forrester at Bubble Brothers they were treated to a glass of our Móinéir Irish Raspberry Wine combined with a Camel Valley Brut from Cornwall. 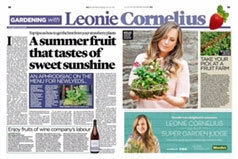 Named the Deoch of Cornwall, it seemed to go down a treat! And what a great idea it is to combine one of our Móinéir wines with a wine from your guest’s part of the world - building bridges and making friends! 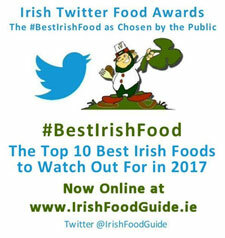 Since the very successful launch of Móinéir, at Bloom in the Phoenix Park, in June 2016 we have received fantastic publicity and endorsements from food and wine experts, critics and the media, along with a great response from the public. Thanks so much to everyone who has supported us so far! We are proud to be a Verified Member of Bord Bia's Origin Green, Ireland’s world-pioneering programme of commitment to sustainable food and drink production. With our lifelong and personal commitment to the environment sustainability is close to our hearts and we carry this concept throughout our production process. Our fruit is either foraged or selected exclusively from Bord Bia-approved growers, and the fruit pulp that remains after the berries are pressed is broken down into microbially-rich compost, used for food production. Learn more..